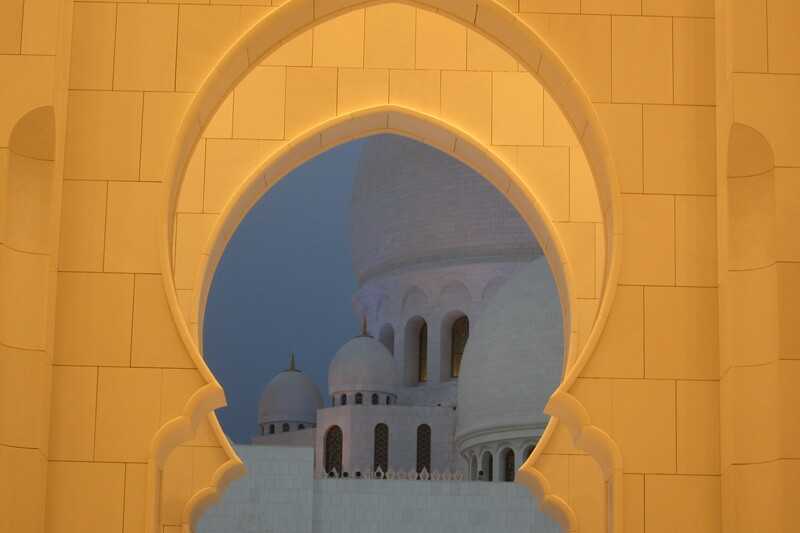 The highlight of any trip to Abu Dhabi, and maybe to U.A.E. 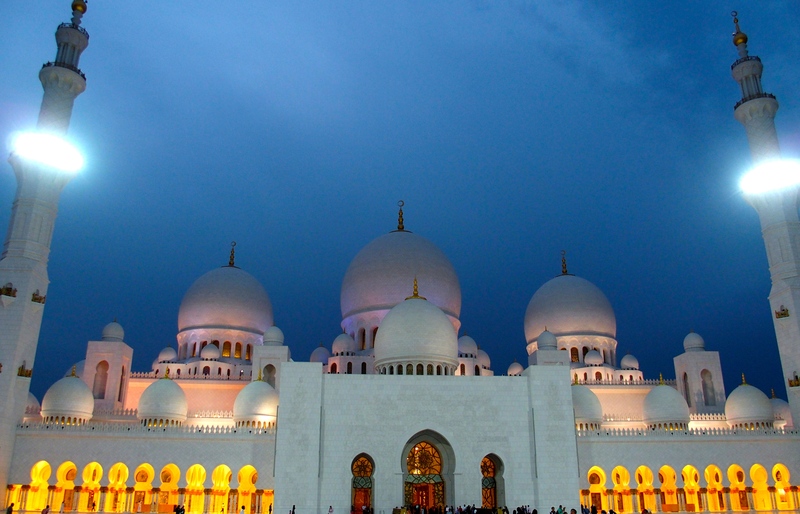 in total, is the Sheikh Zayed Grand Mosque. 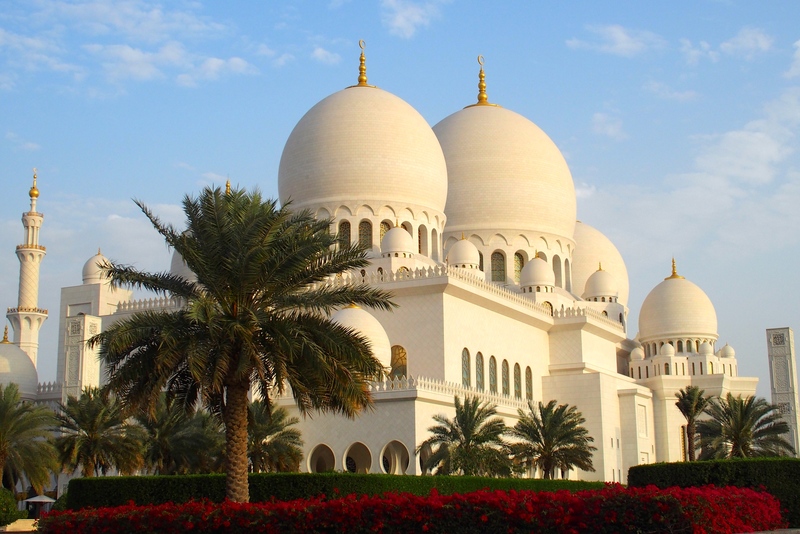 This is the largest mosque in the world. It is larger and perhaps more impressive than either St. Peter’s Basilica or the Taj Mahal. 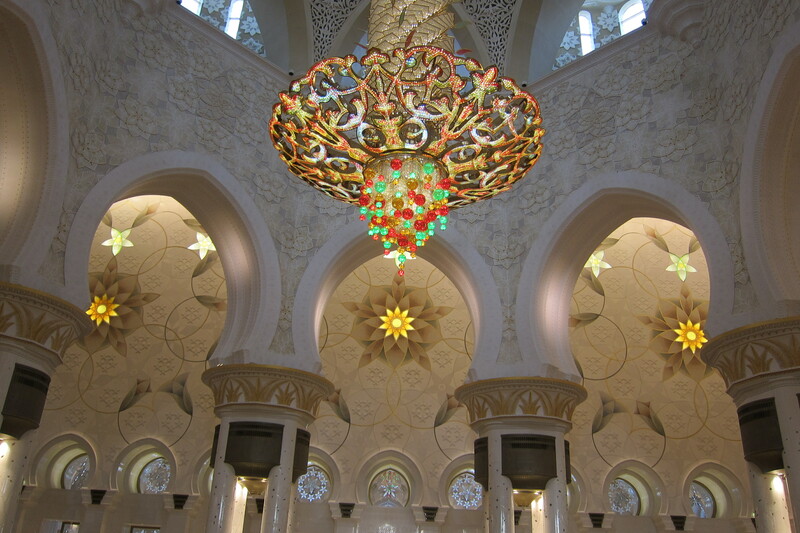 Both the exterior and interior of the mosque are amazing. 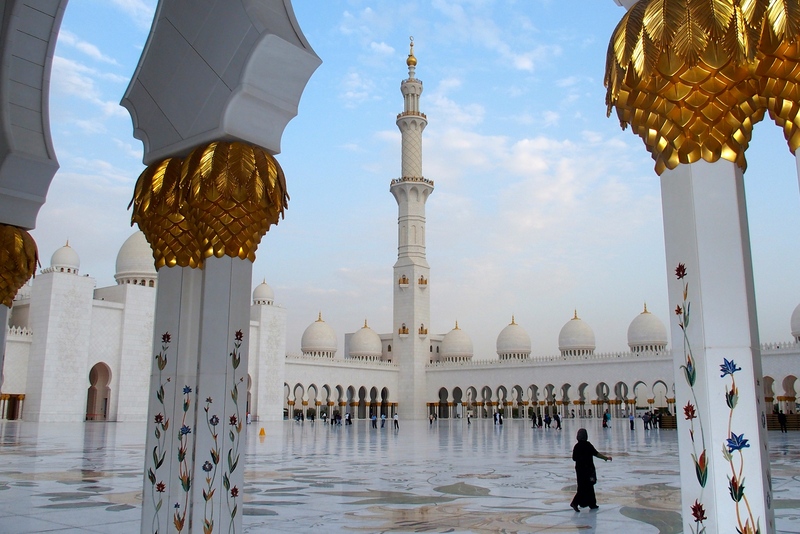 Most of the space is open to tourists, with only the prayer areas closed off so Muslims can practice their religious rites in private. 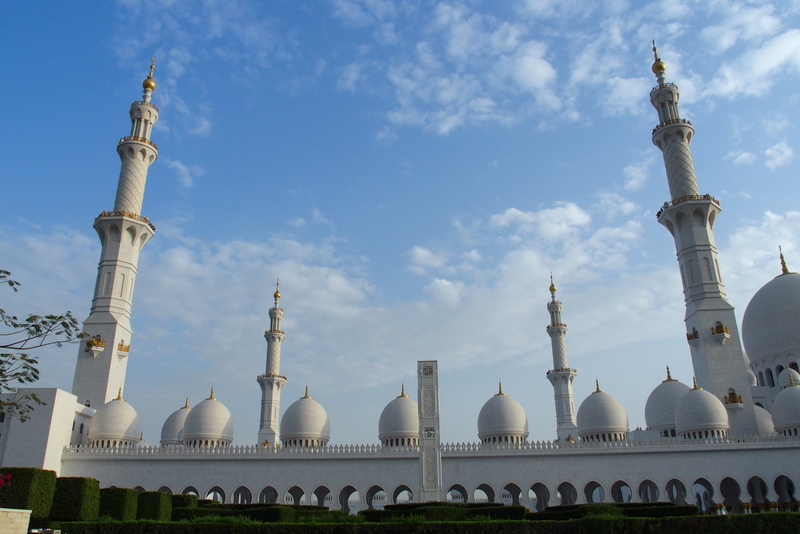 Four minarets on the four corners and 82 domes. The complex is 30 acres in area, hard to get everything into a single photo. Surprisingly, it’s not an ancient building like the Taj Mahal (built in 1653) or St. Peter’s (1626). It was completed in 2007! 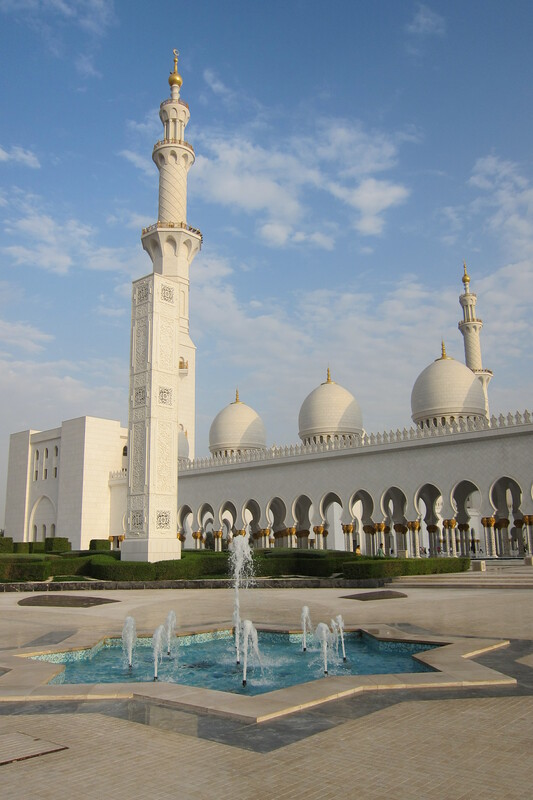 The mosque is named for the late Sheikh Zayed bin Sultan Al-Nahyan, who wanted to show unification of Islamic culture through architecture, art, and spirituality. The structure also used building materials sourced from numerous countries, again showing unification rather than isolationism. 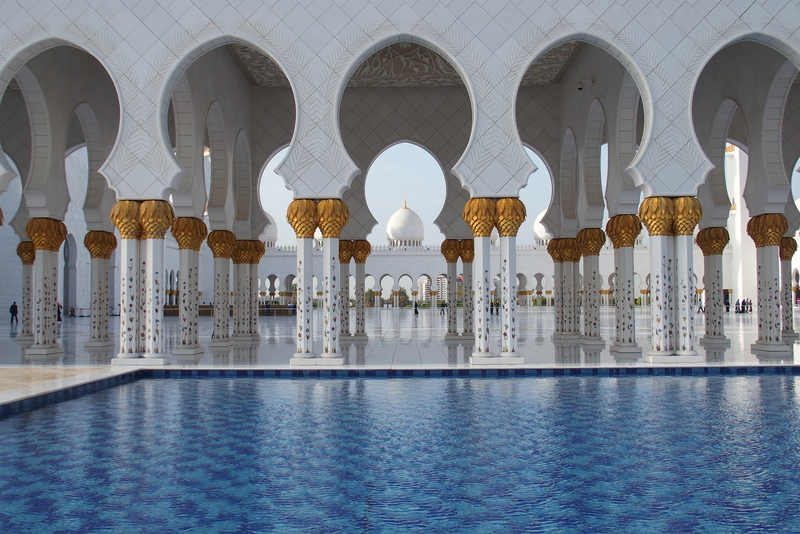 The shallow reflecting pools mirror the white columns. On each side of the inner courtyard is a long corridor. With thousands of visitors a day, you wouldn’t expect to see so much empty space. But it’s just so big. One corridor is for men and one for women. A guard very politely redirected Michael when he wandered into the wrong corridor. Oops! Doesn’t he look chagrined? 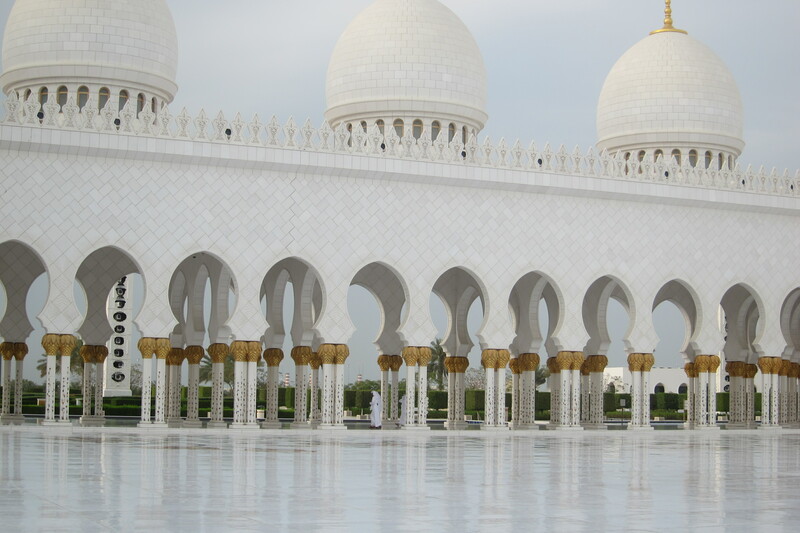 Although women are not required to wear clothing to cover their hair and ankles in general in U.A.E., inside the mosque they are. Men too have to cover their legs. Selena Gomez recently had an ankle showing in an Instagram photo at the mosque. Muslim fans were not happy. 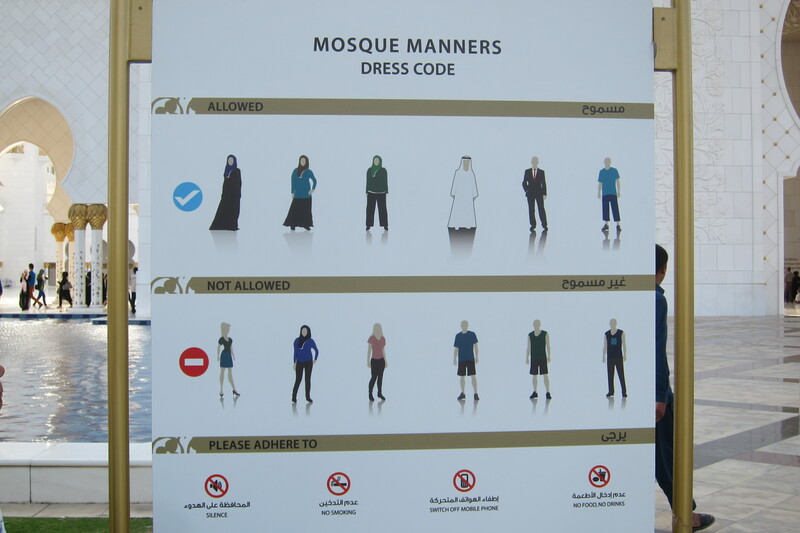 Fortunately, black abayas (cloaks) and shaylas (headscarves) are available for women to borrow and white dishdashes (cloaks) for men who show up in shorts. My scarf was adequate when worn over my head even though it wasn’t black. Color coordinated with the floor of the reflecting pool rather than black. We saw Islamic women wearing abaya and shayla (not always black), niqab (black cloak and veil with open slits for eyes), and full burka (black head to toe, eyes behind a black veil). Question: When women in burka do selfies, can they tell who they are? 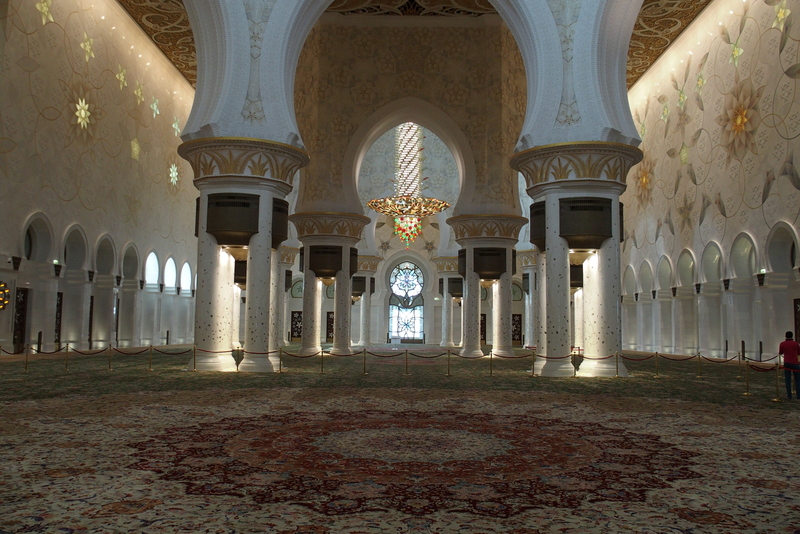 Visitors are also required to remove their shoes before entering the interior of the mosque. This was quite pleasant, since the path through was on a plush carpet. 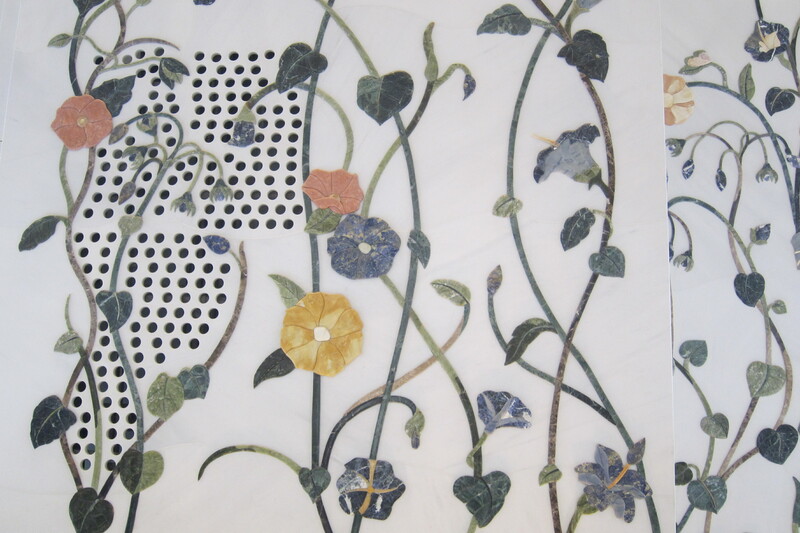 This rug is the largest in the world, over 61,000 square feet or 1.4 acres in area. It took 1,200 artisans 12 months to hand knot it. There was so much to see, every detail exquisite. 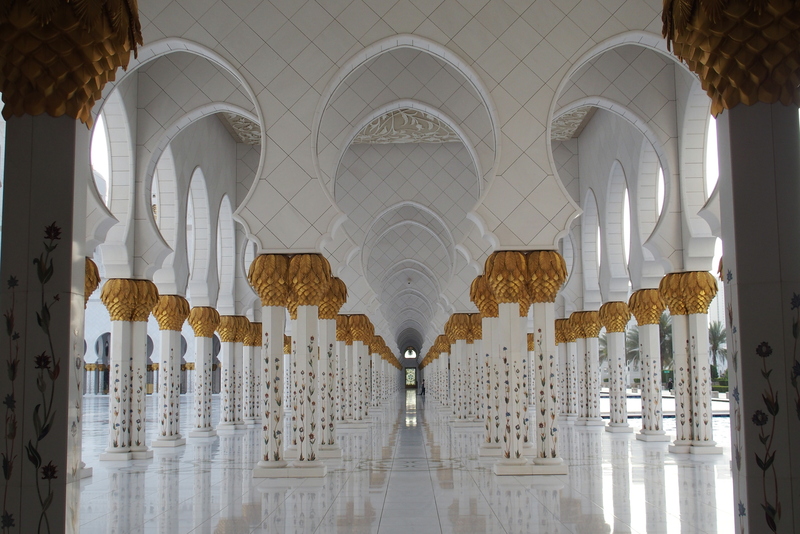 The marble is white to symbolize purity and piety. 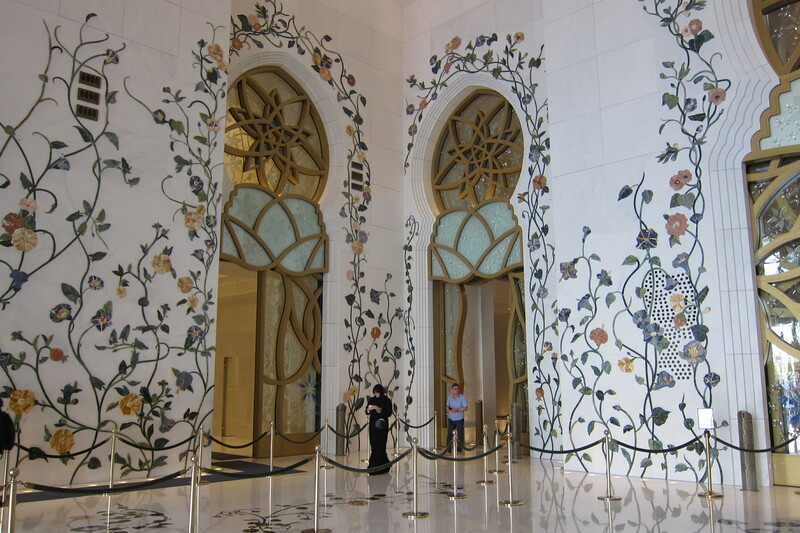 The designs are Islamic geometrics and florals. Beautiful from far away or close up. 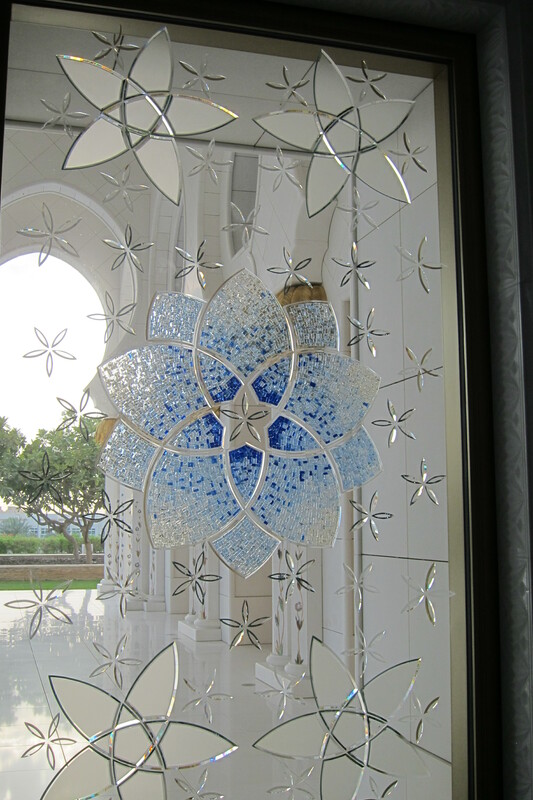 Looking out to the courtyard through amazing glasswork. This chandelier was made in Germany by Faustig. It weighs 12 tons and contains Swarovski crystals. Another chandelier with Swarovski crystals. This one is only 2 tons. 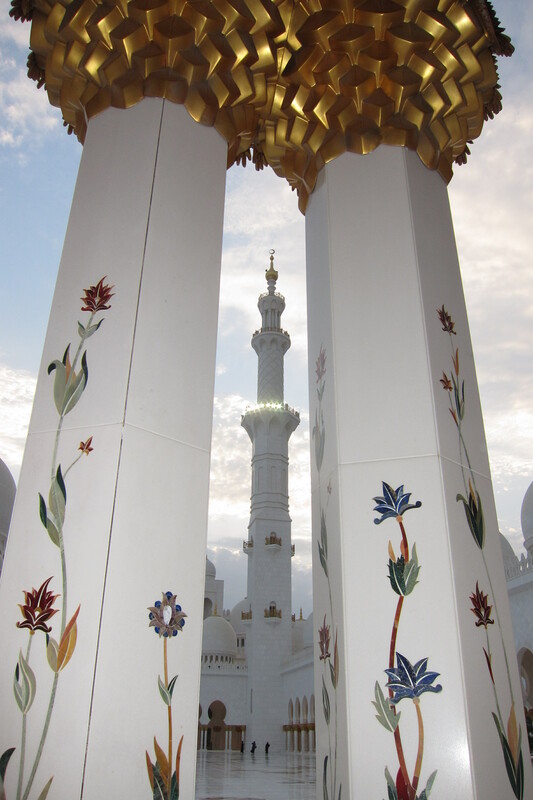 Outside the mosque is beautiful too. Note the red bougainvillea landscaping. 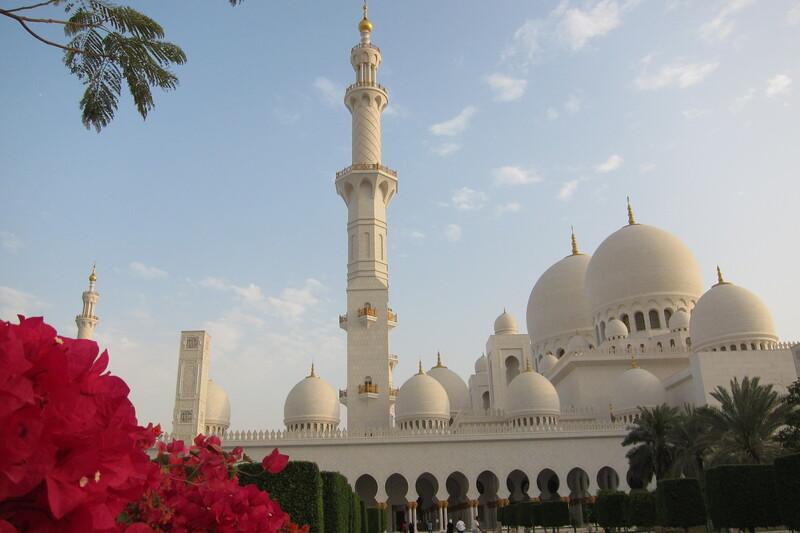 Not as big as the Dubai Fountain, but still quite pretty in front of the mosque. 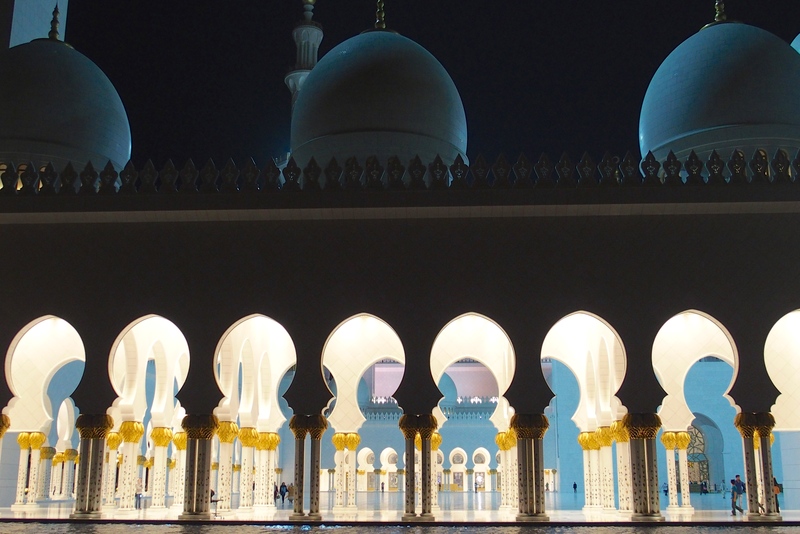 Just like snowflakes, no two views of the mosque are the same. We visited during the day and stayed on into the evening. 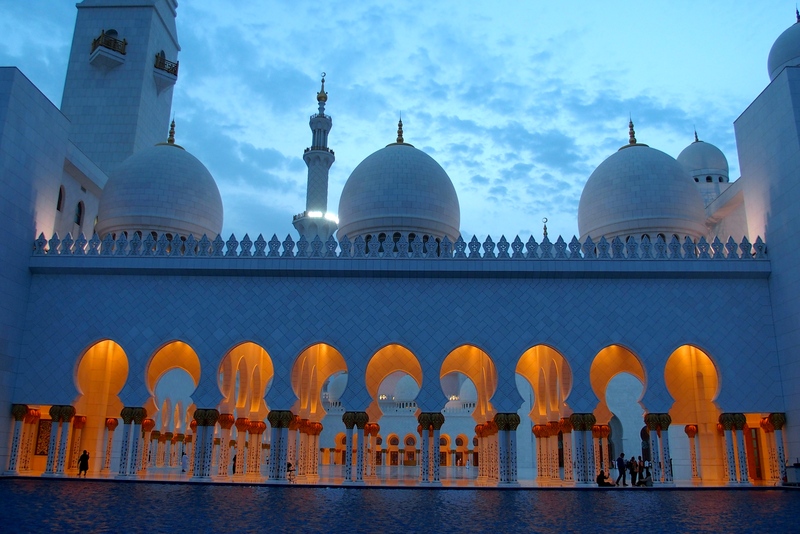 The mosque takes on an even more spiritual atmosphere as the sun goes down. Note all the details in gold. 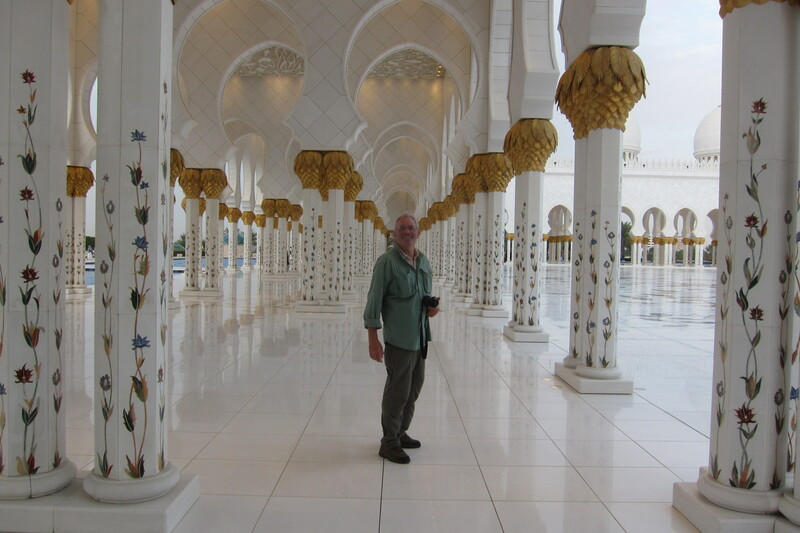 The onion dome pattern repeats in the arches. It looks very warm and inviting. The outdoor lighting is adjusted to follow the phases of the moon. 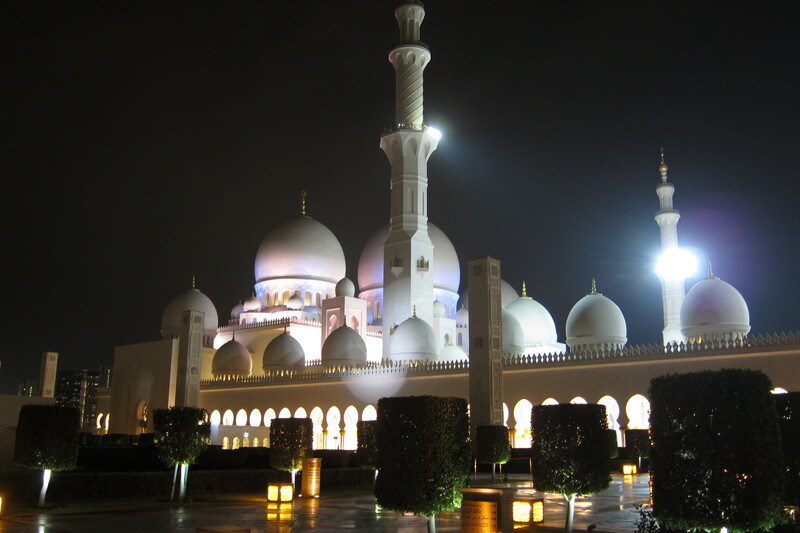 The mosque after dark…outside. It is still brilliantly lighted inside. The whole place was so strikingly beautiful it was difficult to leave. 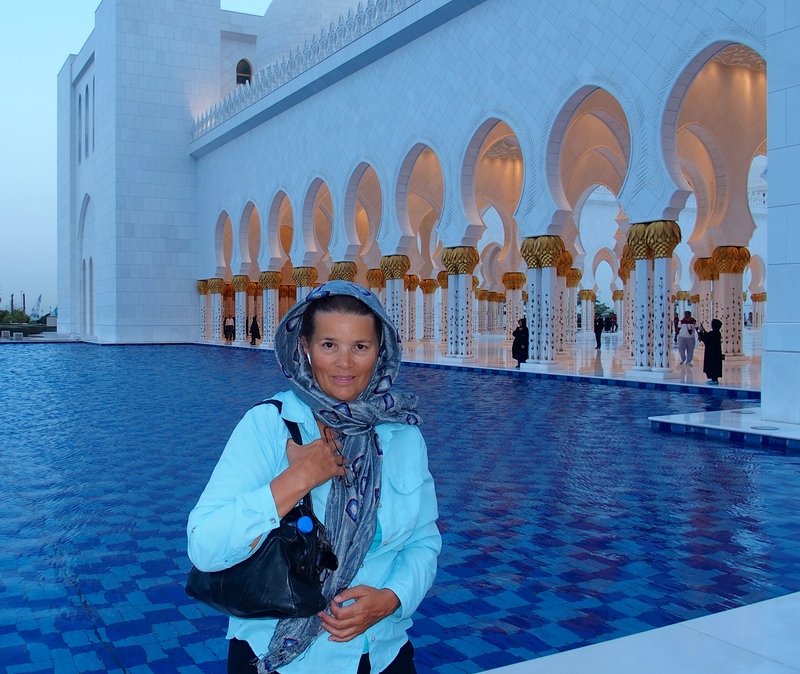 This entry was posted in Travel Journal and tagged abaya, Abu Dhabi, mosque, Sheikh Zayed Grand Mosque, U.A.E.. Bookmark the permalink. Reblogged this on Mosque Locator.